We are please to announce a fantastic new release from our publishing company: Boomtown Portsmouth. The book will be available for sale on Tuesday, December 20th, just in time for Christmas. You will not be able to buy this book anywhere else on the planet, so call us now (603-431-2100) to pre-purchase your copy (or copies)! Portsmouth’s World War II legacy is well hidden. The city’s narrow streets, which offer frequent glimpses into its heyday during the era of sailing ships and colonial struggles, reveal little of the events that occurred on those same streets during World War II. Yet it is that wartime transformation that revitalized the city and equipped it to move so boldly into the future that it enjoys today. Boomtown Portsmouth tells the story of that frenzied transformation—a story with many subplots: booming navy yard, hordes of immigrant workers, a flood of federal dollars, burgeoning population, unprecedented prosperity, U-boat threats, a mined harbor, blackouts, raucous liberty town, soaring VD rates, massive infrastructure development, and much more. 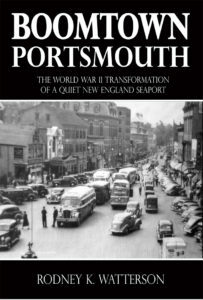 The story concludes with an aggressive postwar plan designed to capture the best and shed the worst of that wartime experience—first steps on the path that led, in time, to the prized jewel that Portsmouth is today.